A Maisie Dobbs bargain: In This Grave Hour – Joyce's mystery and fiction book reviews with some non-fiction too! 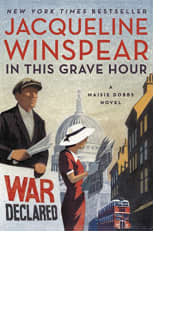 All of the Maisie Dobbs books by Jacqueline Winspear have been excellent. The novels are best read in order but are worthwhile no matter how you do it. The series begins around the time of WWI and is now taking place during WWII. Maisie is a self-aware heroine who has a strong moral compass in a world that is often in chaos. You will value spending time with her, her family and her friends. If you have enjoyed the Maggie Hope series or books written by Charles Todd, you will not regret giving this series a try.